A group of enterprising young people in Kibera, Nairobi's largest slum, have turned to making art from animal bones. The jewelery items range in price from $3 to $5 and are a big hit with locals and tourists alike. Soweto Restaurant is located in the sprawling Kibera slum. The restaurant serves around 500 people a day and at any given time is filled with customers. Today is no exception. Restaurant owner Mutua Mutiso said his customers like meat. "My customers like chicken, beef and liver. They also like from boiled meat and the roasted kind. The prices are quite affordable and that keeps my customers happy," he said. But some of his customers, like George Otieno, prefer the bones. Otieno is the 25-year-old co-founder of Victorious Bones, a youth group that began eight years ago with the purpose of turning bones into art. Otieno buys discarded bones for his workshop once a month from Soweto Restaurant. 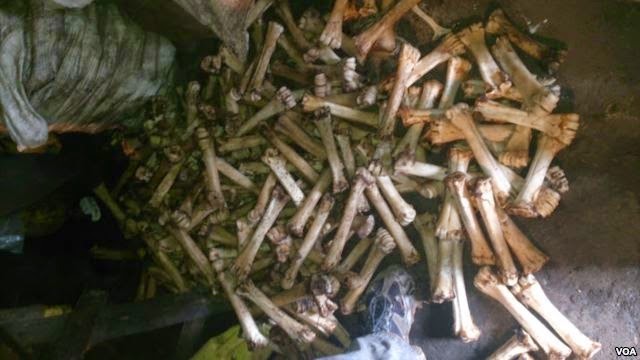 "I usually buy the waste bones for around $5 per kilogram. This forms the raw material for the jewelery that I shall later make. Products are made from cow, goat and camel bones. A cow bone costs 20 shillings [23 cents] while goat and camel bones are 15 shillings [17 cents] and $1 respectively," he said. ​Back at the workshop, not far from the Soweto restaurant, he cuts and sharpens the bones using a circular blade and then smoothes them down with sand paper. The next step is boiling the bones with hydrogen peroxide to remove oil on the surface and to make it easier to apply color. "I then apply candle wax to the boiled bones -- the waxed part will remain white and the other part will become black when the bones are dyed," Otieno said. "In the final stage, I put the bones in a container filled with dye for an hour to enable them to have a long-lasting color." The bones then become earrings, necklaces, bracelets and rings. Depending on the complexity of design, a piece of jewelry can take six to 20 hours to complete. Otieno said his Victorious Bones group can make 500 earrings and 150 to 200 necklaces a day depending on the order. "This is a very competitive business. Our output depends on an order. We usually sell our pieces to tourists who visit us and abroad in Canada and Finland," he said. Victorious Bones partnered with an organization called SEED -- which stands for Students Empowerment through Education and Development -- which brings in tourists to buy the jewelry and finds new markets for the art. "Our organization sources for markets for the jewelery internationally. By doing so we are empowering the group to produce more and employ more young people to do something constructive," said Patrick Aouki, director at SEED. With no capital to buy equipment and rent a workshop, Otieno and his four friends began by pooling their meager savings. They each contributed $1 per week and within a year they were able to buy their first machine and get a space for their workshop. Profits, said Otieno, were put back into the workshop to expand. "The business now boasts 16 bench grinders - used to sharpen, smoothen and draw shapes on the bones - and a big workshop that accommodates 25 artists," he said. "We also employ around 11 people from the neighborhood who earn a decent income from the jewelery." Victorious Bones has also trained more than 40 young people from the slums - giving them a marketable skill and a more viable future.